At 5am on 10 March, I was busy making some pretty sweet bacon and avocado sammies for our plane ride from Auckland to Sydney. Two each – and they went down an absolute treat. Our Sydney – Denpasar flight included a meal – no sammies required. First impressions arriving in Legian (between Kuta and Seminyak) were hugely underwhelming. Sorry Bali. I don’t know. I’m still trying to get my head around the whole rubbish on the beach thing. It’s blimmin’ sad. But I don’t know whether to be sad or angry. And should I be angry at ourselves because as tourists we’re in a way making the problem worse? Becasue I definately feel uncomfortable about it. So many thoughts that still need thinking. A bed, a proper door, a toilet seat, a creepy gremlin statue, breakfast (yes, that’s a banana and jam jaffle) and a SWIMMING POOL surrounded by an awesome garden. From meal one in Bali we got stuck into the nasi and mie goreng. We quickly moved to cap cay and curries then onto the small local eateries that don’t have menus or names on the food but you just point, sit down, eat and watch the local soap opera on the telly and it’s delicious but it’s SO spicy you have to blow your nose and then you pay $3 (not each, total) for the pleasure. BOOM! It’s good to be back. Back with the scooters and the dust and the street dogs, the bum guns and the sweet smell of, I don’t know, is it waste water mixed with rubbish? But that sweet smell of South East Asia. By day three I’d had multiple swims, had multiple mosquito bites, was 3/4 of the way through my book, had a haircut and was back in a pair of harem/travelling pants. So comfortable. I’d forgotten about the whole behind the knee sweat thing and my new flowery pants were doing their thang and soaking it right on up. No slippage or sticking to chairs for me anymore. Nailing life. Three nights was plenty of time for us in this part of Bali for the type of travelling we are doing. 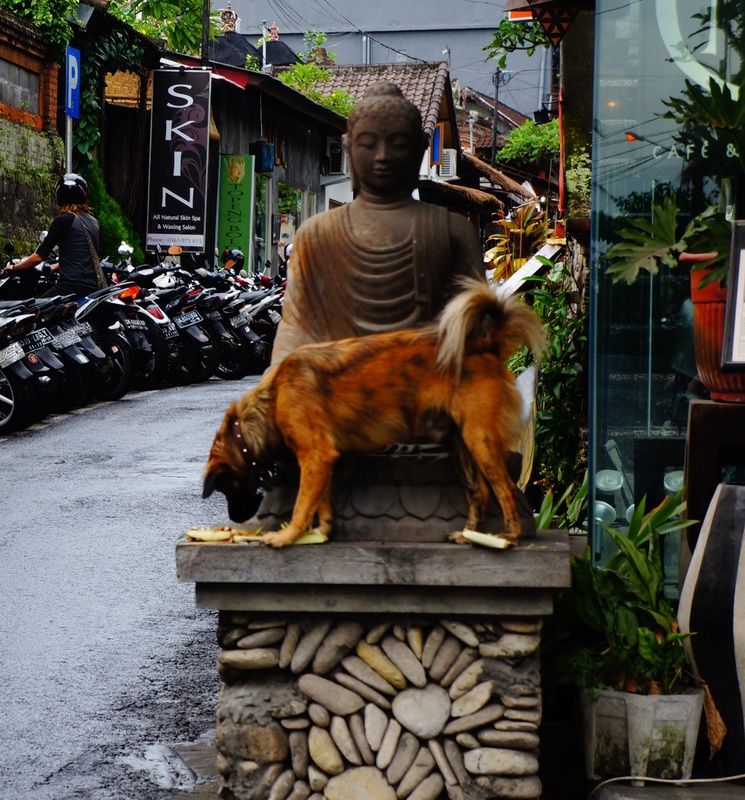 We travelled up the road to Ubud. $22 got us a room at a hotel with a pool. Perfect in 30-35 degree temperatures. Ubud is in the mountains and is full of artists, handicrafts, rice paddies, good food, yoga and just by breathing in the air, you feel better and calmer about life (yet to be confirmed but it’s the feeling I got). We did the obligatory visit to Monkey Forest. And once again I was reminded that humans and monkeys aren’t so different. The following day we did a cycle tour. We were the only ones booked so we had our own personal guide. The tour started with a trip to a coffee plantation. We smelled a zillion different things, tasted 12 different types of tea and coffee that they make, Michael had a kopi luwak (coffee made from beans that a luwak – a cat/possum type bush animal – eats and then poos out) and by all accounts it was ‘delicious’ and ‘pretty good’ AND we saw a chameleon. We got stuck into the 35km downhill cycle through rural villages and rice paddies and we were not disappointed! After three days in the hustle and bustle of Ubud, we splashed out and moved out of town to some of the nicest accommodation I’ve ever stayed in, complete with rice paddies at our door step and a full outdoor bathroom. Oh yeah, and the infinity pool was massive and AMAZING. Three nights at Sapu Lidi was out of our budget BUT it was a huge treat, extreme bang for buck by New Zealand standards and all together, lovely. When I think back on our time in Bali with a few weeks of hindsight, what I remember most is the food, and the offerings that scatter the footpaths. 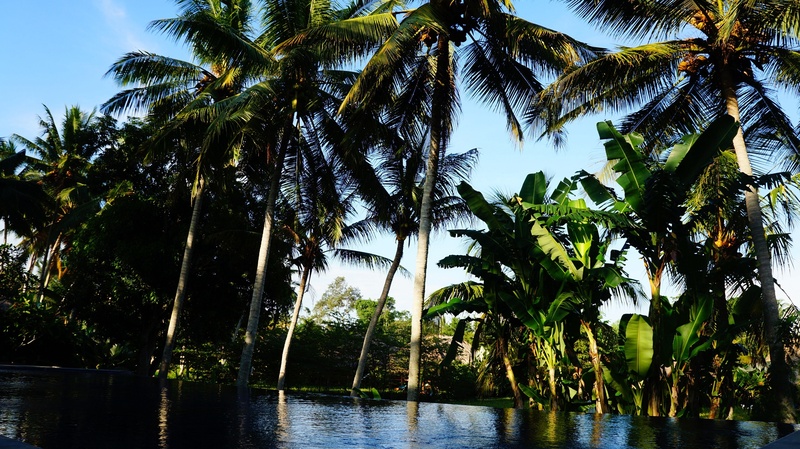 Our favourite restaurant would have to be Biah Biah in Ubud – a wee place serving Indonesian tapas on banana leaf. Prices ranged from around $0.70 – $8.00 and you could get a huge range of dishes like lemongrass chicken, satay sticks, pork and pear salad (above – YUM! ), tempe nuggets and all the other usual local fare. The daily offerings or ‘canang sari’ made by Balinese Hindus is the other thing that sticks in my mind. Made and destroyed in the same day, the offerings are placed in streets, doorways and on statues in an effort to appease demon spirits. Men and women weave the small baskets and place flowers, petals, maybe a small amount of food or even a cigarette in them. The next morning they are swept away and replaced. But sometimes, a sneaky sausage gets amongst some of the offering action.